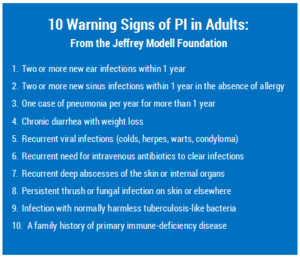 Do You Know the Warning Signs of Primary Immunodeficiency (PI)? 01 May Do You Know the Warning Signs of Primary Immunodeficiency (PI)? The Immune Deficiency Foundation (www.primaryimmune.org) has estimated that it takes 12.4 years from initial symptoms to the time a patient is diagnosed with Primary Immunodeficiency. An accurate diagnosis of primary immunodeficiency may be delayed because the primary symptom of the disorder, a series of infections, can easily be attributed to “ordinary” illness, especially in children. While many types of primary immunodeficiency disease have been identified, all types share similar symptoms—notably recurring, frequent infections that can be long-lasting and severe. 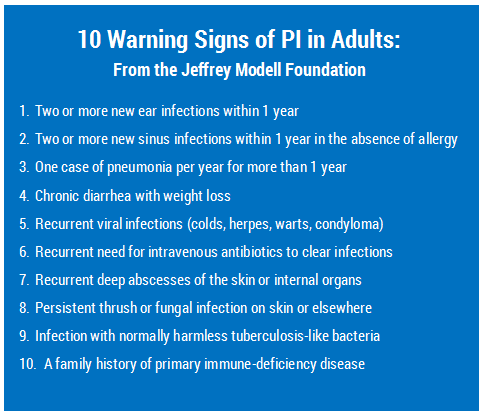 In addition to infections, patients with PI can develop other complications. Usually, PI can be detected using simple blood tests, which may include immunoglobulin levels and functional antibody responses. Referral to an immunologist is recommended for diagnosis and treatment. Redline Specialty Pharmacy provides immune globulin (IG) therapy to patients with PI and other conditions requiring IG treatment. Our trained staff of pharmacists, pharmacy technicians and nurses are available to answer your questions about immune globulin therapy. Learn more about immune globulin (IG) with Redline Specialty Pharmacy or contact us to discuss further.